Available in both retro silver or black bodies, the BESSA-R is composed of an all aluminum die-cast metal casing with a streamline body that fits comfortably into the palm of your hand making it a paradigm of design simplicity. It is lightweight, precise, and extremely durable with excellent corrosion resistance. This camera offers precision and reliability under all photographic conditions. I was very impressed with this body when I first bought it. It was a definite step forward when compared to my "beginner" FSU body. When I received it, it has the dreaded rangefinder misalignment, and after a bit of DIY repair it was ready to go. It served me well for many months and was my go to camera. The rangefinder getting knocked out of alignment while getting moved about in the bag was my biggest complaint. I got to be pretty good at taking off the hot shoe cover and getting it back into alignment =p. Then, one day, the shutter started to hang open at the lower speeds. Then the high speeds went. Now I have a nice little paper weight, since i bought it (cheaply) second hand and don't have any sort of warranty. The shutters on these cameras are far too over complicated and are just begging to break down. But other than that, I guess I really enjoyed it. The plastic didn't bother at all like I thought it would. I bought the grip so that it wouldn't hang around my neck at a weird angle. It's a good solid camera, just make sure you get the warranty on it so that if you have a problem you can fix it. I find the Bessa R to be a very simple reliable camera that is fun to own and use. The metering system is as simple as it gets. Three leds in the viewfinder indicate exposure. I also have the Voigtlander Color Skopar 35mm lens. This is a splendid compination that creates stunning B&W prints. If you are looking for a entry level Rangefinder this one certainly should top the list. The viewfinder is also big, clear and bright. A selector switch at the top of the camera moves lines inside the viewfinder for different lenses. You will enjoy this camera. I've had the Bessa R for over 18 months now - and despite worries about some of the design points such as a plastic back and ridiculous sunken rewind it has proved to be a faithful companion. I don't drive, like to travel with as small a bag as possible and this does me proud ! I had a period a few months ago when the shutter seemed to stick and then go off at random, but that seemed to cure itself. The body, after all, is only a box to hold the film and screw a lens in - anything else is a luxury. I must admit that I've never been into auto-focus or even fully auto exposure ( I prefer the illusion of control ) so I don't miss either of these. The lenses are great and I really can't justify buying Leica or Canon lenses to fit even if I could afford it - they can't be that much better. I do find the lenses a bit on the cool side, however. I agree with comments made about the viewfinder - at first I thought that it was my vision, not the camera ! And those strap lugs - aargh! But, based on results, I have to say that this camera has encouraged me to take the best pictures of my life. 3. Spot-on exposures with build in exposure meter (within its limits). 4. Light weight and small in size. 6. Takes widely available SR/LR44 batteries for the exposure meter. 7. Can operate without batteries. 8. No time lag as with AF cameras. 9. One can see the flash go off through the finder. 10. Bright and accurate enough rangefinder for VC lenses. 11. Clear, distortion free viewfinder with clearly visible framelines. 13. Easy film loading and unloading. 14. 1/125th flash sync speed. 1. Too bright LED readout under dim lit conditions. 3. Camera shakes a bit because it’s too lightweight. 5. Body easily smudged with fingerprints and dirt. 6. Exposure meter range, weighting and brightness. 7. Strap lugs placement when using lightweight lenses. 8. Not a ratcheted wind lever. 10. Manual exposure only (I love half automatic exposure). 11. Rangefinder base could be bigger. The black body looks quite nice but is easily smudged with fingerprints wherever you touched it. The placement of the strap lugs is well chosen when heavier lenses like the 75/2.5 and 50/1.5 are used but when a lightweight lens is screwed on the camera it keeps flipping 45 degrees towards its back. The 35/2.5 and 75/2.5 CV (Cosina Voigtländer) lenses I own are of excellent optical and mechanical quality. The Bessa-R handles well and I have seen no mechanical problems yet. I do not expect these cameras, however, to last as long as my Nikon gear, but they might surprise me. If you’re in love with Leica’s and the famous Leica build quality then buy a Leica and NOT Voigtländers. If you cannot afford a Leica or just want a very useable LTM (Leica Tread Mount) rangefinder camera with a built-in exposure meter then go for the Bessa-R (Russian cameras are Spartan and heavy compared to Bessa’s) and take the camera for what it is; a relative cheap body with a very nice range/view-finder and built in exposure meter. Screwing the lenses on and off is often quite a time consuming job. The frames have to be set manually on the Bessa-R, doing this can be easily forgotten when changing lenses in a hurry. I do not dislike the plastic parts on the R as well as I do not dislike plastic parts on my Nikon F801. In fact, plastic can withstand small shocks better than metal does (will dent). This makes the camera very lightweight, which is fine for travel. The Rangefinder spot and framelines are very bright and do not flare. In bright as well as in dark situations the Bessa-R is very easy to focus. One of my R’s has (slightly) slanted framelines, enough to get slanted horizons when composing with respect to these framelines. This I have seen with more R’s that I checked out so be warned, the framelines in my other R are unslanted. You will have to position you’re eye very carefully in the centre of the viewfinder to be able to see the bright double image focussing spot. Strangely enough, when the lens is set on infinity and you position you’re eye so that the focussing spot is clearly visible and then focus to the closest distance the focussing spot disappears and you will have to re-position your eye to be able to see it again. This has to do with the automatic parallax compensation, which is a nice feature but has this drawback. No vertical rangefinder misalignment with either of my R’s. The Exposure meter is easy and fast to use under ‘normal’ light conditions. 2 red arrows with a plus and minus in them and a red dot in the middle for correct exposure are clearly visible in the bottom of the viewfinder. The exposure meter is almost as sensitive in the upper and lower part of the image as in the centre but not sensitive on both sides of the frame, therefore, you will have to exclude the sky when metering! For shutter speeds below 1/8th (800 ASA) the exposure meter cannot be trusted anymore for correct exposure. When photographing in low light-levels there is another problem with the exposure meter readout, the LED’s are far too bright under these conditions and the viewfinder can be completely ‘showered’ with a bright red glow and an almost blinding LED readout makes focussing very difficult. The shutter itself runs smooth but has a high-pitched click not suited for shooting in quiet surroundings. You can feel the body shake a bit when the shutter runs off. Shutter noise is not excessive but a bit too loud for my taste. The shutter speeds range from 1 second to 1/2000th and the flash-sync speeds up to 1/125th, which I like a lot. A flash can be connected on a hot-shoe AND via a PC connection. No TTL flash, alas… this I miss dearly. Winding is smooth but not ratcheted. Pulling out the rewind lever isn’t a hard thing to do, just hold the camera upside down while prying it out. Loading and unloading film is very easy and the film window is a very underestimated big ‘plus’ for this camera. Film rewinding drags a bit and you can hear the film ‘scream’ a bit while rewinding. Leica CL, Leica IIIC, several Zorki’s and FED’s , and a lot of fixed focal point rangefinders. I wanted to like this camera. Cosina's concept of a budget-priced Leica Thread Mount body, as well as its revival of a time-honored camera manufacturer's name, was very appealing to me. Having watched the new Voigtlander line from a distance, once the prices fell to under $300 for a new Bessa R, I committed. It was not long after receipt of the R that disappointment set in solidly. I did not have issue with the oft-criticized plasticy construction. I actually prefer a lighter body and was willing to tolerate a bit of polycarbonate. Indeed, the R is lightweight, making it easy to forget I even had one around my neck. What a wonderful relief from my heavy, bulky 35mm SLR gear. I found the R to "feel" fine. Rather, my complaint with the R is the fact that, in only one outing and three rolls of film, I experienced camera malfunction and serious quality control shortcomings. Where shall I begin? With my particular R, I found (too late) that the framelines and everything else that displays itself inside the viewfinder were substantially slanted, downward and to the right. If you composed according to the framelines, the result images had correspondingly slanted horizons. Very annoying. Yet if you composed according to the inside edges of the viewfinder itself, ignoring the framelines in the process, the resulting images had level horizontals. Unacceptable. As I advanced to the 24th frame of a 24 exposure roll, I suddenly found the film advance lever jammed mid-stroke, locking everything up completely. I pushed the film rewind button and tried rewinding the film, but nothing budged. I tried nudging the film advance lever forward, but met with complete resistance. Fighting off panic, I performed an unrepeatable sequence of pushing the rewind button in, applying light pressure to the rewind lever, then walking the film advance lever gently forward, and in about 30 seconds everything freed up, thankfully but inexplicably. Upon receipt of the processed film, I found on all three rolls that the negs began on frame #2. I also lost the last image on each roll, with only half of the exposure on the film. As it turns out, the film counter was off by 1. Having purchased the R at Cameraquest, I contacted the proprietor to report these problems. I was advised that I would like the R2 better, because it was an all metal body, and it "felt" so much better. Return of the R for credit and acquisition of an R2 was offered as a solution. I had to remind Cameraquest that my complaints were not at all about the "feel" of the camera, but the fact that it simply didn't work. After my persistent complaining, I was told I could return the camera for inspection. Once returned, Cameraquest acknowledged that the framelines were slanted, and advised that the other R bodies he had in stock were similarly slanted. I was finally offered a full refund, which I accepted. Cosina obviously lacks quality control. My particular R was trouble from the onset, and I note that Cameraquest admitted all their R bodies in stock had the slanted framelines. As far as handling, the camera strap lugs are poorly placed, on the front of the camera body, causing an unnatural and undesirable backward slant of the body, with the viewfinder always attempt to drill its way into your chest. The camera back is constructed of an odd rubberish material that, while grippy, tends to show every little mark. The paint (I had the black R) is very flat and smooth, also tending to show marks. The R and R2 have an odd film rewind crank that is recessed into the body. It usually takes several frustrating attempts to coax it out of its den to do its duty. The R is not suitable, due to its short rangefinder base length, for accurate focusing of either fast or long lenses. The Bessa T is much better for this. I own, or have owned, the Bessa L, T, R and R2 bodies, and can say without doubt that the R is the least desirable of these. I cannot recommend it. Cosina should either strive for improved quality control, or abandon the R entirely. I will not, as many other reviewers have, discuss the Voigtlander lenses available for the Bessa R, as this review is for the R body itself. After my persistence, and resistance to a "bait and switch" attempt, I received a full refund. Fantastic optics at any price .. Feels super in ones hands.. Light and durable .. fast to use. Exceptiona viewfinder/rangefinder!!! This fine camera has been in my hands nearly every day - in and out of New York City for over a year. It's truely a great feeling, working intuitive instrument. I have owned Lieca M and yes they are fine as well, but to be honest I like this better .. The 35mm Ultron is outstanding. The 75mm Color Helier is outstanding. I use an older Canon rangefinder lens for my 50mm. I have several cameras of different types and makes .. when I leave the house in the morning I have a choice ... the Voightlander Bessa is almost always what I reach for .. it feels great in the hands, and the results are truely outstanding (sounding like a broken record here!) but it's true ..
Viewfinder/Rangefinder brightness & accuracy. Top shutter 1/2000. Flash sync 1/125. Accurate meter. Lightweight. I've used this camera for over a year with no problems and have always gotten first rate results. Never had any of the problems described by other reviewers. Rangefinder was aligned correctly when I got it and remains that way today. I've shot B/W neg, color neg, & color transparency. Meter is accurate. I purchased the 35/1.7 w/the camera. An outstanding optic! I recently picked up the 15mm heliar w/external finder. Another nice optic. Still trying to get used to the angle of view. Excellent camera for the price. I had an M6 TTL w/a 50/2. Wonderful lens. Nice camera. It ate batteries and the finder patch flared out a lot. I sold it & don't regret it. The Voigtlander system is outstanding. I'm considering purchasing the R2 for the all metal body. Although I've never had issue w/the durability of the R body. I'm rating this camera 5 out of 5. The only thing that will tarnish this review is long term reliability. My first rangefinder and this one enlight me on photography. All manual control means I have to think before shoot. Built quality is absolutely not up to leica standard but who can when you see the price tag. Light weight with a very bright viewfinder. No problem on focusing. Lens are sharp and contrasty esp. 21/4. While I was on trek, this is a good company. Absolutely the best entry rangefinder camera. Outstanding Voigtlander lens selection. The Ultron 35mm f/1.7 is excellent. The optics are superb. Exceptionally bright and clear viewfinder. As good and possibly better than the viewfinder on the Leica M6! It is definately the second best rangefinder viewfinder next to the M6. Quick, accurate rangefinder focusing. Shutter speed goes up to 1/2000, if needed. Comfortable feel. The body is not as delicate as some have reported. While it is not a tank like the Leica M series, it is fairly solid for the price point. Excellent price, even though some say it should be lower. Who wouldn''t say the price should be lower. Full manual operation. Only the meter requires battery power. Hyperfocal distance scales on lens make for quick shooting (more a feature of the lens than camera) Great value. The "finishing" on the body could be better. The film advance lever, frame selector lever, and self-timer lever not chrome, but a dull metal alloy finish. (minor) Setting the shutter speed and ISO may be awkward for individuals with large fingers. (minor) Film rewind crank somewhat quirky. (minor) The rubber finish on the body is prone to marks, particularly the film door back. (minor) The self-timer mechanism feels cheap. There''s not another way to say it. Of all the features, this one feels as though they skimped on the quality construction. May prove problematic in the future (I''ve only used it a few times) Neck Strap eyelet placement could be better. (minor) Neck strap has metal strap loops rather than plastic. This presents the possibility of scratches to the body. (minor point, easily resolved with a different neck strap) Long term reliability not known. But from initial use, I don''t see a reason why it wouldn''t provide years of reliable service. The Bessa R with the Ultron 35mm F/1.7 lens is a joy to use. The viewfinder is incredibly bright, the focusing is quick and accurate, and the meter does a good job. My rangefinder is dead on. Photographs are sharp and the Ultron 35mm F/1.7 lens produces excellent photographs. It is worth noting that the Ultron 35mm lens blocks a portion of the lower right corner of the viewfinder. I''ve gotten used to this and don''t feel it is a problem. 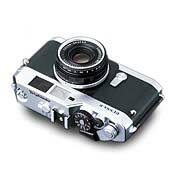 While the body doesn''t have the great, solid feel of a Leica, for the price point the Bessa R feels reliable. It doesn''t feel as cheap as some reviewers have mentioned. The body is comfortable to hold and the Ultron 35mm lens focuses easily. The self-timer mechanism, however, seems a bit quirky and I question its reliability. Like others, I''m not fond of the placement of the strap eyelets. But, they are functional. To set the ISO, you have lift the filmspeed set ring on the shutter speed wheel. The placement of the film advance lever makes this a bit awkward. The film rewind crank can also be awkward to use, especially for someone with large fingers. Sometimes, when rewinding the film, it feels as though the film lags. I''ve often wondered if it is being "dragged" back to the film canister. It doesn''t seem to affect the negatives, however. The shutter release button feels good. The shutter mechanism is not as quiet as the venerable Leica, but quiet enough. With the lens, this camera is light and small enough to take just about anywhere. I''ve carried the body in one pocket of my overcoat and the lens in the other, making for easy carrying. With practice, the lens mounts in the screw-mount easily and quickly. I use the Metz Mecablitz 34 CS-2 with the Bessa R with great results. The Metz is silver and black, just like the Bessa R. The two look made for each other. So far, I''m delighted with this camera. I have two BessaR bodies and a selection of optics. This camera is great if you do not give it rough handling. For street photography this camera works as well as the expensive Leicas. But make no mistake, it is NOT a Leica, and it is made for diffrent market.